How to Make Ice Planer Serving Fresh Typical Cirebon .Cirebon City proved not only to have a special dish savory dishes like Empal barrel, but also has other tasty dish with fresh sweet treats such as shaved ice Cirebon. Sergeant ice is cold fresh food at once beverages consisting of ingredients such as avocado flesh, grass jelly, young coconut meat, pieces of jackfruit and sweeteners sugar and milk. 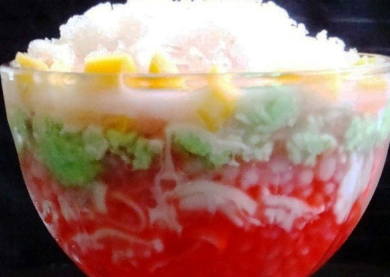 It's easy and not complicated in making this Cirebon typical shaved ice. Fresh dish can be present as a treat for guests who come to the home or also treats during breaks and family. Simple steps in presenting a fresh dish of shaved ice can you see in the reviews how to make fresh shaved ice dish typical of Cirebon below. Pour water into a saucepan and heat until boiling additional joint pandan leaves and sugar, stir well. Lift after being cooked. Shopping avocado and shaved meat and then pour into a serving bowl. Likewise with coconuts. While grass jelly and fruit jackfruit ukutan cut into small squares and pour also into a serving bowl. Next add the ingredients in a bowl with a splash of coconut milk and sugar water that has been created previously. Add also the shaved ice and a splash of sweetened condensed milk into the mixture ingredients in a bowl to taste sweeter and fresher. Shaved ice is already finished and ready to be presented. Cirebon typical shaved ice could be serving you fresh during the day. Please try! 0 Komentar Untuk "How to Make Ice Planer Serving Fresh Typical Cirebon"